Since november has fully arrived with all its darkness and gloom, I have turned to making broth. Years back, I’ve developed a very strong dislike of the taste of dried/cubed bouillon. Only the tiniest bit ruins the best dish in my opinion, for even if it’s not made with glutamate or yeast, I find it has an overpowering artificial taste. At the same time, the idea of using store bought meat stock always disgusted me, since I had no idea where those bones really came from. So for a long time – and because I was often too lazy to make my own vegetable broth – I cooked my soups with mere water. But oh, I have to tell you, what a revelation it was, when I finally used up my first litres of gelatinous chicken broth that I made using the chicken’s carcass (I know this sounds really ridiculous, considering that this ‘revelation’ would make all our grandmothers laugh). I’ve recently reintroduced (organic) meat into my diet, maybe you’d also like to read about the health benefits of broth here and here. Even if you are vegetarian or vegan it is really worthwhile to make your own vegetable broth for it is such an easy way to pimp your dishes! I have started to collect my vegetable scraps (and bones) in a bag in the freezer (a great tip tip from Sarah Wilson) and when I’ve got enough, use them up, making broth. What could be better than arriving home, having made your way through the cold, and warm yourself with a delicious soup or stew? This one is especially comforting for it combines a certain sweetness from the sautéd shallots, the cauliflower and the coconut milk with ‘warming’ spices such as cumin and smoked paprika. Also this soup will keep you warm and satisfied, it is rich in healthy fats, protein and fiber and leave you truly nourished for hours. Chop the shallots. Melt the coconut oil in a large pot and sweat the shallots for at least 15 minutes, be careful not to burn them, rather you want them to soften and caramelize. Cut the cauliflower into florets. Chop the garlic. Roast your cumin and caraway seeds in a pan without oil and grind them using a mortar and pestle (by now a lovely warm smell will fill your kitchen). Add garlic, cumin, caraway, nutmeg, chili and salt to the shallots and fry for another 3 minutes. Then add the cauliflower and sauté for about 15-20 minutes on medium heat, until the cauliflower tastes roasted. Add chickpeas, coconut oil, stock and almond butter and let it simmer for another 20-25 minutes. Meanwhile roughly chop the whole almonds and roast them in a pan without oil. Take the pot off the heat and blend it with a hand blender until creamy. Then stir in the almond meal. To make the smoked paprika butter, place the butter in a small saucepan and melt it on the lowest heat. The milk solids will then separate from the butter fat. Continue to heat until the milk solids turn golden, but make sure they don’t become too dark. This gives the butter a delicious nutty flavour. Stir in the smoked paprika powder until it’s completely dissolved. 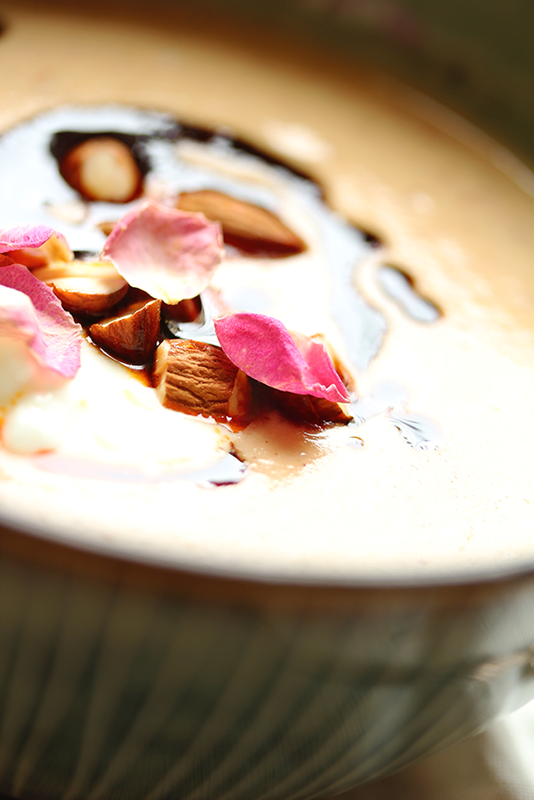 Remove from heat and spoon on your soup together with a dollop of yoghurt and the roasted almonds. In case your making the herb-alomd butter: Roast the allspice berries in a pan without oil and crush them. Set a few leaves of the herbs aside. 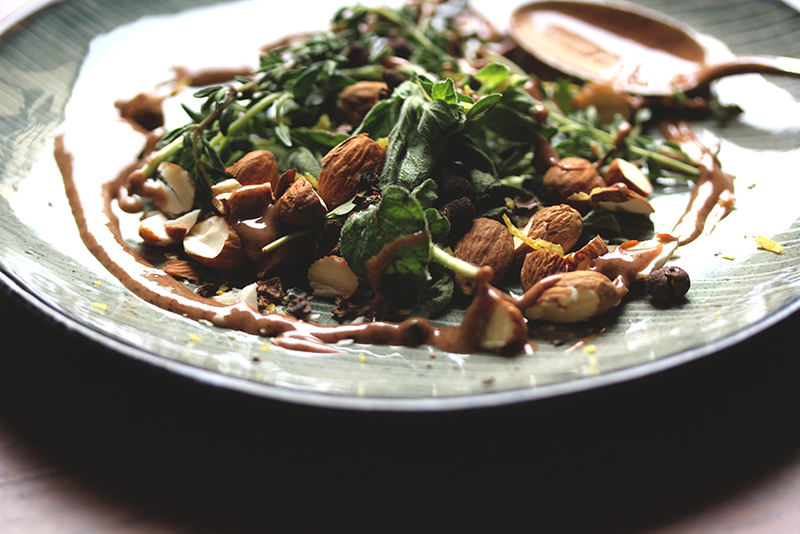 In a food processor or with a hand blender, blend herbs, zest, salt, allspice and almond butter until smooth. Add a dash of lemon juice if you want an even fresher taste. 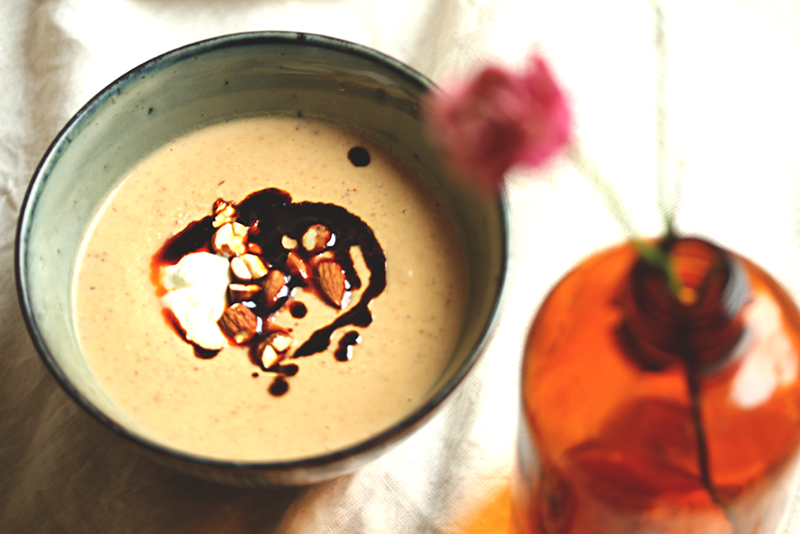 Serve the soup with a generous spoon of the butter and top with herbs and roasted almonds.